Dell's tablet computer, due out in a few months, will be the first of several, company says. Dell's tablet, tentatively called the Mini 5, due out "in a couple of months." Say the words "tablet computer" and ten bucks says it's Apple's iPad that springs to mind. But that doesn't mean other companies aren't busy building their own version of a touch-enabled, multimedia-sporting, slab of portable computing goodness. Dell's first effort at a tablet will be the Mini 5 (a name that is still in beta) -- a slice of plastic and glass with a 5-inch capacitive touchscreen that according to Michael Dell will debut "in a couple of months." The Mini 5 will sport a 5-megapixel camera on the back, a separate front-facing camera that can be used for video conferencing, a standard 3.5-mm headphone jack, Wi-Fi and 3G connectivity and a Qualcomm Snapdragon 1-GHz processor. The 5-inch screen also means it will be be closer to the Sony PSP in its form factor than the longer legal notepad design of the iPad. 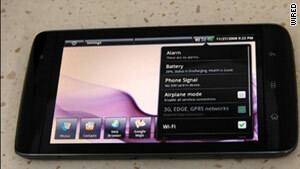 The Mini 5 will run the latest version of Google's Android operating system, version 2.0 or higher. And instead of the 4:3 aspect ratio of the iPad, Dell's tablets will support the 16:9 ratio. Widescreen films anyone? "It's a device optimized for media consumption," Neeraj Choubey, general manager of the tablets division at Dell told Wired.com. "It will offer the full Web-browsing experience so you have something that you are holding in your hand that replaces everything the smartphone does and takes on quite a bit of the features of a laptop." The Dell 5 Mini will also just be the first in a series. "We are going to have a family of tablets," says Choubey. "The first one is a 5-inch screen but we want to scale that up to a variety of screen sizes." That means future versions of the Mini 5 could have larger screens that will be closer in size to the iPad. Dell wouldn't comment on pricing, beyond saying it will be "competitive," or when it will launch this year. Apple's iPad ranges from $500 to $830. With the launch of iPad in January, the tablet PCs are going through a renaissance. Though PC makers have offered slates and convertible notebooks for nearly a decade, consumers haven't bought them in droves. With its 9.7-inch display, sleek design and Apple's relentless hype, the iPad could alter the way we experience mobile computing. And Dell knows this. Three years ago, Dell started expanding its product line to include mobile products. Dell smartphones are now sold in Brazil and China and it hopes to bring a version to North America. Meanwhile, the company set up a tablet division, and three weeks ago Choubey joined Dell from venture capital firm Venrock. As he sees it, the Mini 5 will offer the apps that are available on smartphones, a set of specialized tools and programs for business users, a strong movies-and-music experience and Web surfing -- Flash and all included. Take that, iPad. Along with the apps on the Mini 5, users will have quick access to e-mail, YouTube, Amazon's MP3 store for music, as well as spreadsheet, presentation maker and documents. It will also support voice recognition. And these are characteristics that will be common to all tablets from Dell. Still it will be a hard sell to consumers, says Van Baker, an analyst with research firm Gartner. "If all you are bringing to the market is another media-playing or handheld-gaming device, then it's not going to work," he says. "It's all about the services you have behind the device." And that's where the iPad scores, with its strong developer ecosystem and 100,000 apps, along with iTunes and iBooks, says Baker. Dell is betting it can offer that and add a compelling value proposition for business users: a promise that its tablet won't just be a coffee-table device but instead a powerful productivity tool. "There's no reason why you can't use the tablet to take notes in class," he says. Dell will also offer services such as syncing that will allow users to move music, documents and other data between their PC and tablet easily. "At a very basic level, you would have a service that will share content across the devices seamlessly and have it in the cloud," says Choubey. Dell also hopes to draw on the Android ecosystem by offering developers the opportunity to port their Android apps to the Mini 5 and its successors. For the Mini 5, though, its PlayStation Portable-like form factor could be a big drawback, says Baker. The Dell Mini 5 is closer in its looks to gadgets better known as mobile internet devices or MIDs, a category that has been languishing despite products from companies such as Lenovo and Archos. "If the Dell Mini 5 is this small and it is pocketable, then why isn't it a phone?" asks Baker. "If I am going to carry a second device, it better have something that's a significant advantage over what I can do with my phone. With the iPad, the value proposition is a much larger display." But Choubey says the innovation is not just in the form factor but also in the business model. Dell will work with carriers to bundle inexpensive data plans for the Mini 5 and other tablets. "That type of model -- the way iPad was able to do with AT& T -- will become more prevalent with these tablet devices," he says. "It allows the carrier to increase number of devices per user." Apple introduced a $15 for 250 MB, or an unlimited $30 a month, no-contract data plan for use with the iPad.